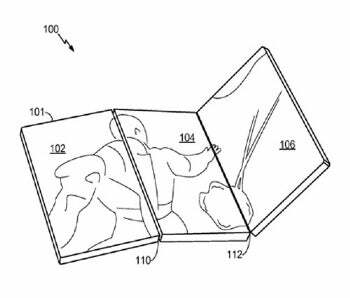 The idea is that a device could fold up like a Nintendo DS or a flip-style (clamshell) cellphone, and then unfold to display some kind of user interface (UI) that spans continuously across all of the screens. 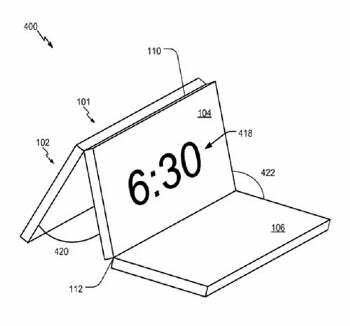 Drawings from the official patent application show that a tablet using this screen could be shaped like your average restaurant’s triple-folded table menu. 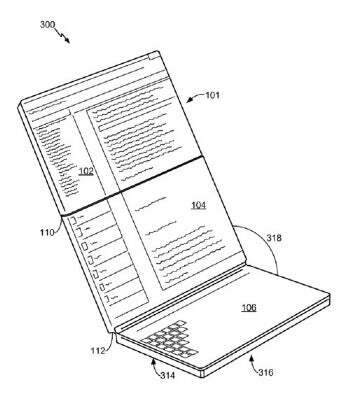 The language of the patent application indicates that the inspiration behind the design of this tablet-like device is an emphasis on smaller form factor devices, which are ‘limited’ to having smaller display screens. In essence, having a smaller screen only limits the user’s ability to interact with the product and is therefore a hindrance to their productivity and overall experience. The proposed device’s ability to be “folded” will allow it to retain the key points of being compact and portable while providing the user with a larger display (that is comprised of the [three] interconnected connected screens). The concept user interface in the patent application changes depending on its physical orientation. This is because the screens will be able to detect their orientation in relation to each other through the use of one or more “accelerometers, inclinometers, or any combination thereof." Thus, “based on a current folding configuration of the device, the UI may be a panorama UI, a desktop UI, an application UI, a web browser UI, an alarm clock UI, a media player UI, or some other UI”. Long story short, this means that not only can the UI can be displayed both horizontally and vertically, its features can change based on how you hold and fold the device.. It sounds like a really interesting way to take multiple displaysbeyond the familiar “mirror” and “extended” display modes that twe're used to. As of right now, all we can do is speculate about such a device’s true capabilities, but even so, it seems like this sort of thing could make for some interesting innovations in programming technology. Beyond the automatic detection of physical orientation, the language of the patent suggest that the screens could be orientated in just about any direction. The patent also says that aa device “may be configured to have a larger screen size or may be configured to have a small form factor for convenience and portability.” That is, you could probably pick between how many screens you want to use at a time. Unfortunately there is no particular, announced product at this time, so it simply remains a concept at best. It is unclear where exactly Qualcomm expects to take this patent but we can probably take a wild guess that it will catch people’s eyes in whatever form(s) it ends up taking. Think about the next time you need to use map. You could use your common, handheld GPS-capable device or you could whip out an entire foldable, digital map like in all of those sci-fi movies. Let’s see the iPhone or iPad do that! So, what are your thoughts about this patent? Do you think it sounds like a genuine, decent innovation or just an excessive exploitation of technology? What do you think it will be able to do? What do you want it to be able to do? It’s only a patent right now, so who knows – your idea might actually come into fruition! So please, share your thoughts with us!